“You have to find a way to learn from winning,” said Brad Frost, women’s hockey coach at Minnesota.”It’s a lot easier to lose and learn.” Frost’s team racked up victory after victory in 2013. Without any losses to reflect on, though, Frost decided to rethink everything he was doing. He shortened practices. He introduced new workout drills. He changed the days his team studied tape. 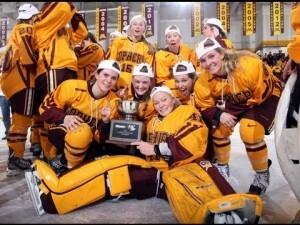 Minnesota became the first team in women’s hockey to go undefeated. Its final record was 41-0. Lessons for Kentucky From the Undefeated, The Wall Street Journal, 3/31/2015. It seems to strike many people as inconceivable that when we finally become successful it is too easy to lose what brought about that success. When we are successful, or at least not failing, we too often don’t think hard about what we are doing. It is only when things go terribly wrong that we then spend significant time trying to determine what we should have done. And by then, it is too late. Never confuse tail wind with good management …. The times when you should ask the most questions are when things are going best. Jeffrey Immelt, CEO, General Electric, Bloomberg Businessweek, November 4, 2013. Instead, we need to work hard each day to continually improve even when we don’t have a concrete reason to do so. If nothing else, continuing to improve means that when we really need it, we’ll already be good at it. What are you doing to continuously improve even when things are going just fine?